After you have uncovered the dependence or autocorrelation in your data (see Variography section above) ... you can make a prediction using the fitted model. Thereafter, the empirical semivariogram is set aside. Still, that doesn't say much about how kriging forms weights. Is it true that we're just using a different set of weight values than the 1/distance in IDW? I understand the semivariogram measures average dissimilarity for a given separation distance, and the values are all non-negative. Can someone explain how the combination/weighting method (e.g. with linear regression or any other variant) on a computed semivariogram works to solve the "summit" problem? Maybe I should begin by stating that "the summit issue is reflecting how IDW models the surface, rather than weighting". IDW sees the predicted surface as an averaging model, while Spline tries to minimize abrupt change to make 'smooth rubber sheet' and Kriging tries to minimize errors. (I hope this makes my point clear). Let me focus on the difference between surfaces predicted by IDW and Kriging, especially how they are related to measured data. IDW (blue line) estimates the values as averages of measured samples, and its surface will not pass through sample points. Its smoothness is controlled by power value, but even bumpy - high power settings cannot make it above the maximum or below the minimum (so, yes, summit problem). Because power is merely working as relative influence of each sample point. Kriging, like Spline, can account general trends and estimate beyond range of sample data. 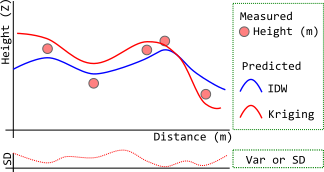 On the above example, though not obvious, measured height has a mild increase toward left-hand side... where Kriging (red line) surface goes higher than the sample points. The surface pass through sampling points if the variance (or s.d.) is zero, but not necessary. I did not answer the weighting aspect of the question, the subject we cannot go without mathematics... and I am really bad at it. Yes, both IDW interpolation and Ordinary Kriging (OK) will calculate weights based on distance, but with different criteria. In both methods, weights do not depend on sample values. The answer from Dahn Jahn in Ordinary kriging example step by step? is very clarifying about this. The main difference is that in Ordinary Kriging distances are used to measure the correlation structure among sample points (i.e. how similar they are based on lags of distances) and this correlation structure is captured in the form of the variogram model. The variogram model is used to calculate covariances (or semi variances) among sample points and between sample points and prediction points, which are used to calculate weights. Calculate weights (using the Lagrange multiplier method). Predict (and estimate kriging variance). How does Ordinary Kriging form weights? For a detailed mathematical explanation and theoretical insights about Ordinary Kriging refer to materials linked in 'References'. where: C(h) = covariance; a = nugget effect; σ² = sill (σ² - a = partial sill); r = range. We want to predict a value so that Ŷ0 = wiyi where Ŷ0 is the predicted value at location 0, wi is the weight from sample i and yi is the observed value from sample i.
i) E(Ŷ0) = E(Y0). For this to happen, ∑wi = 1 and the mean is stationary (i.e. E(Yi) = u, given any i). ii) σ²_ε = E[Y0 - Ŷ0]² = Var(Y0 - Ŷ0) is minimized. where L is the Lagrange function, λ is the Lagrange multiplier and 2λ(∑wi - 1) is the part that guarantees ∑wi = 1. Cij is the covariance among sample points i and j and Ci0 is the covariance between sample point i and prediction point. So, w1 = 0.353, w2 = 0.353, w3 = 0.293 and the Lagrange multiplier = -0.505. See that ∑wi = 0.353 + 0.353 + 0.293 = 1. # psill = partial sill. # which means approximate 1/3 of the distance where the curve flattens. How can Ordinary Kriging solve the well-know summit problem for IDW? (whereby IDW cannot predict a higher value outside the range of the control points. Besides Kazuhito's answer, this is also addressed in Edzer Pebesma's answer to Kriging values greater than the most extreme value of the input layer?. Bailey and Gatrell. Ordinary Kriging, Ch. 5.5. Michigan State University. pdf. Rossiter, D.G. Introduction to Spatial Statistics, ITC. Ordinary Kriging explained. xls. Not the answer you're looking for? Browse other questions tagged arcgis-desktop interpolation kriging inverse-distance-weighted variogram or ask your own question. Kriging values greater than the most extreme value of the input layer? How are geocoding scores calculated in ArcGIS? Calculate the values of range, sill, nugget in ordinary kriging? How to make break values which are outside of the value range? How do Natural Neighbor and IDW assign values to pixels? Why are Moran's Index calculated in GeoDa and ArcGIS different?